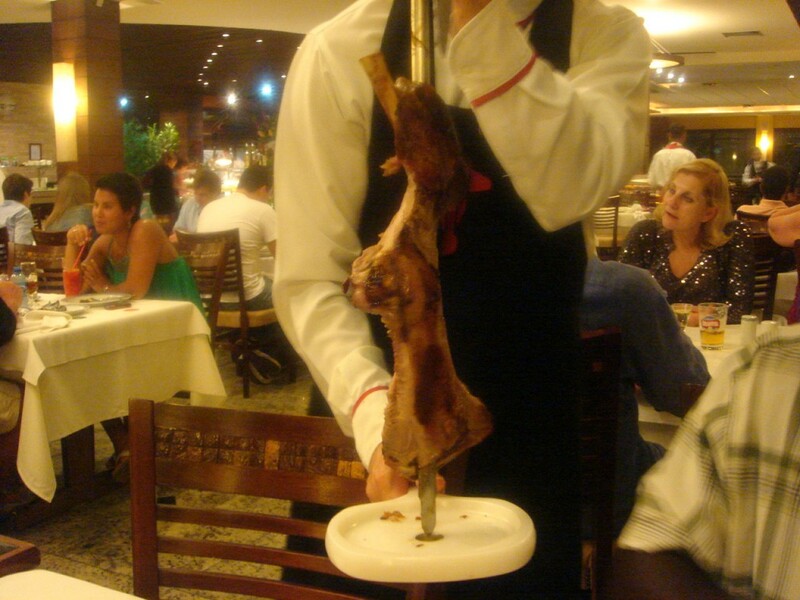 Food wise, a trip to Brazil would be incomplete without a visit to a churrascaria. An all-you-can-eat affair, it offers what is known as a rodizio service. For a set price, you are presented with a choice of various types of barbecued meat (churrasco roughly translates from Portuguese as barbecue) on skewers or platters by knife-wielding passadores (meat waiters) who cut the meat at the table for you. This process continues until such time as you signify that you have had enough. For this purpose, you are usually given a little card with a green side (for ‘yes more meat please’) and a red side (for ‘no more thank you, I feel like I am about to explode because I have eaten too much’). 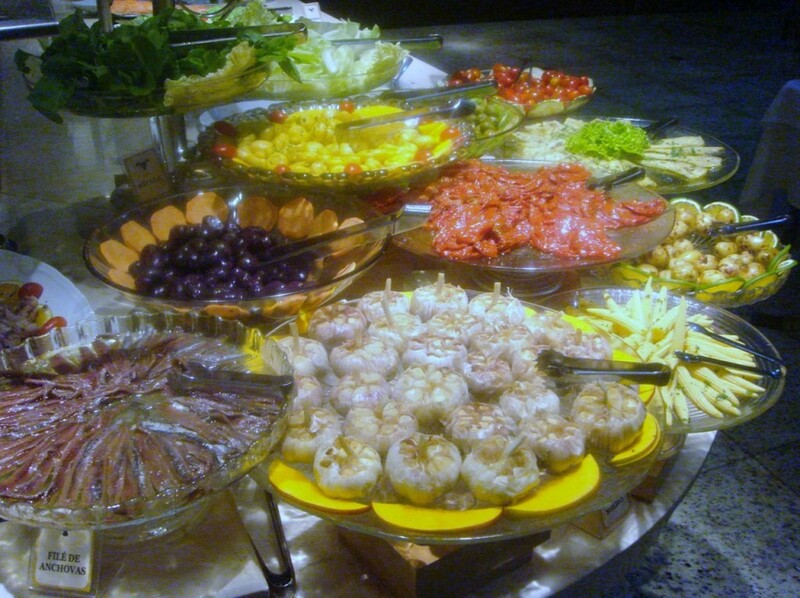 A buffet containing salads, cooked meals, etc, is usually available as well, and Brazilians tend to have this first before starting on the meat. During my previous visit to Brazil, I tried a number of churrascarias along the length of the coast of Brazil. The quality and price varied, but at the better establishments in the bigger cities such as Rio de Janiero, the meat would be so good that I couldn’t help but stuff myself which would often leave me feeling sick afterwards. I don’t usually go for the all-you-can-eat establishments – the thought of a Chinese buffet in Chinatown fills me with dread – but a churrascaria adventure is like no other, especially for someone like me who has no stop button. People always talk about how fabulous the meat in Argentina is (and my experience in Argentina has been that you can get bad meat too, although when it’s good, it’s absolutely phenomenal), but Brazilian meat shouldn’t be overlooked because it can be quality stuff too. If you speak to the locals, the two best churrascarias in Salvador are Boi Preto and Fogo de Chão. Both are Brazilian chain restaurants, and the latter has a reasonable presence in the United States as well (about 16 branches). Having tried the restaurant Churrascaria Plataforma in New York a couple of times, I thought the US had adopted this Brazilian rodizio concept quite well, that is, if Churrascaria Plataforma was anything to go by. But the UK seems to do it less successfully. 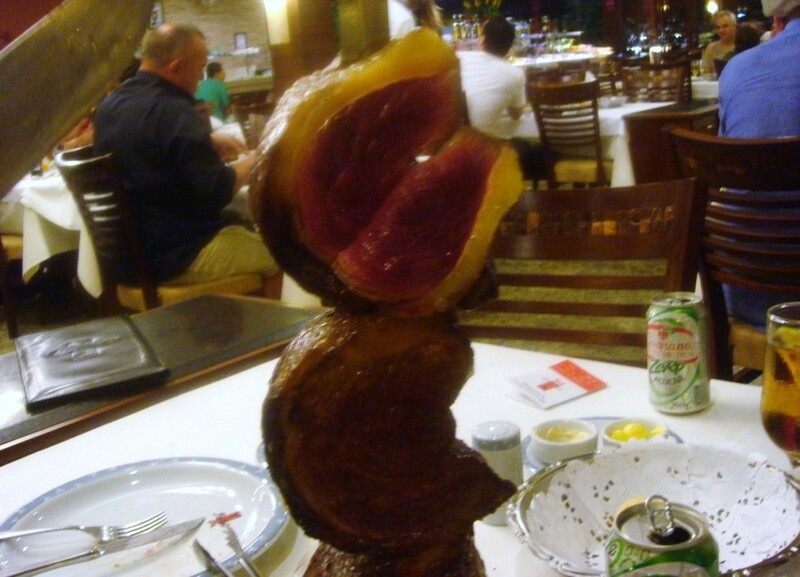 The only churrascaria restaurant that I can think of in London is Rodizio Rico. On its own merits I found the experience to be underwhelming, and when compared to the real deal, well, there really was no comparison. We ended up going to Boi Preto. We had originally intended to try Fogo de Chão, but our taxi driver convinced us that Boi Preto was better, although I suspect very little separated the two in terms of quality for they are both similarly priced. 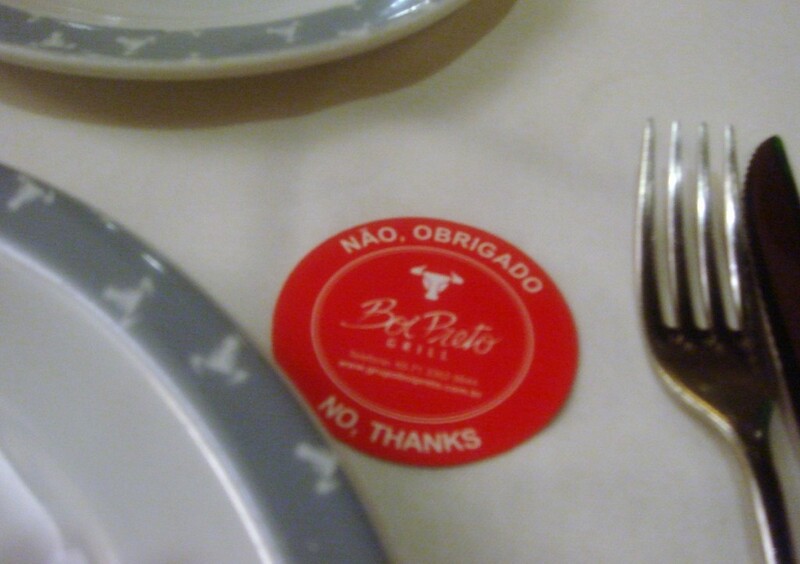 Boi Preto charges R$72 (about £27) for the churrascaria. 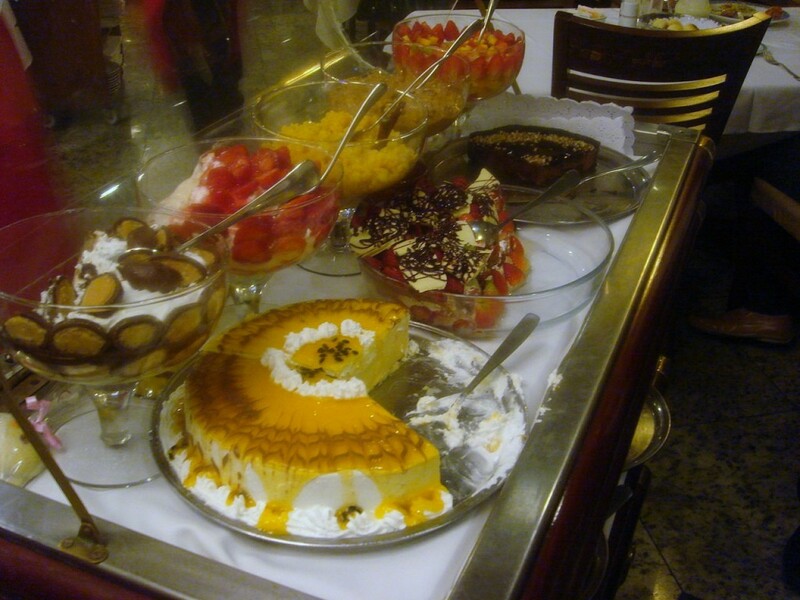 But what was impressive about Boi Preto was the quantity of food laid out in the buffet. 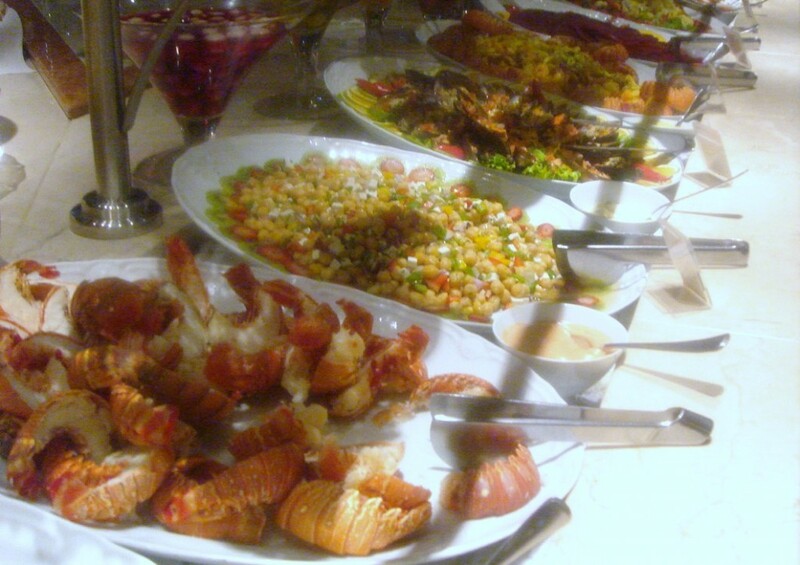 There were about 70-80 different types of dishes (cooked meals, cold cuts, etc), including many different types of seafood such as lobster, sushi and sashimi. There were also various salads. I was a little gobsmacked as I have never seen this amount of variety in a churrascaria buffet before, not even at the better ones that I have been to in Rio. It was difficult trying to decide what to eat. On top of the buffet selection, there was also the meat to consider, and if you’re like me, you will you want to taste everything. But one only has so much space, so it was necessary to strategise. So I went for the high end stuff, ie, the seafood. I had lobster, prawns, octopus, calamari and mussels. All were pretty tasty, apart from the lobster which was a little dry and the mussels which were overcooked and bland. I also tried the salmon sashimi and sushi. The salmon was very fresh and flavoursome, but the rice used for the sushi wasn’t quite authentic. I skipped most of the veg (as that would have taken up precious space), but I did have some of the heart of palm as you rarely see these in Britain (heart of palm is more commonly found in the Americas, especially in Costa Rica). Fibrous in texture, these were very fresh and tender. To the pièce de résistance – the meat. Boi Preto offers nine different types of steak, two different types of lamb, four different types of pork, sausage, chicken, chicken hearts and salmon. In total, there were 20 types of meat and fish to choose from (you can ask for a leaflet which helps you identify the different things on offer). I tried most of the steak cuts and the rack of lamb and left the rest (chicken is chicken after all). The fillet was one of the cuts that I was looking forward to the most, but unfortunately it had been cooked well done. So while it was very tender, it wasn’t as much to my liking as the rump which had been cooked medium rare and which was delicious and flavoursome. I enjoyed this the most, but all the steak was of an excellent quality. As for the lamb, this was average as it lacked a meaty flavour. So my collective experience of churrascarias in Brazil is this: at the upmarket ones, the quality of the steak is usually of a very high standard, although my enjoyment of them has varied depending on their doneness. Therefore, I think the best strategy to adopt is to go for those cuts that have been cooked to the doneness that you like, instead of saying yes to every type of meat as it is presented to you. The meat comes at you thick and fast, and it’s tempting to want to try everything. But being selective about what to eat means you’re less likely to become too full too quickly. This translates to you being able to eat more of what you like! I prefer my meat medium rare, so it was useful to learn how to say this in Portuguese (mal passada). Desserts incur an additional charge, and I don’t know why we decided to get one – we certainly didn’t need it! (Ok, we were being greedy). But the dessert trolley looked great, and it was too tempting to resist. We shared a passionfruit mousse (R$9.50 (about £3.50)) which was very tasty but was not amazing. The service was polished, professional, and relaxed. Plates were cleared and fresh ones presented to us quickly and regularly. We were left wanting for nothing, least of all meat. The steak was of an excellent quality, and most of the items I tried from the buffet selection (other than the mussels and the lobster) were very good. 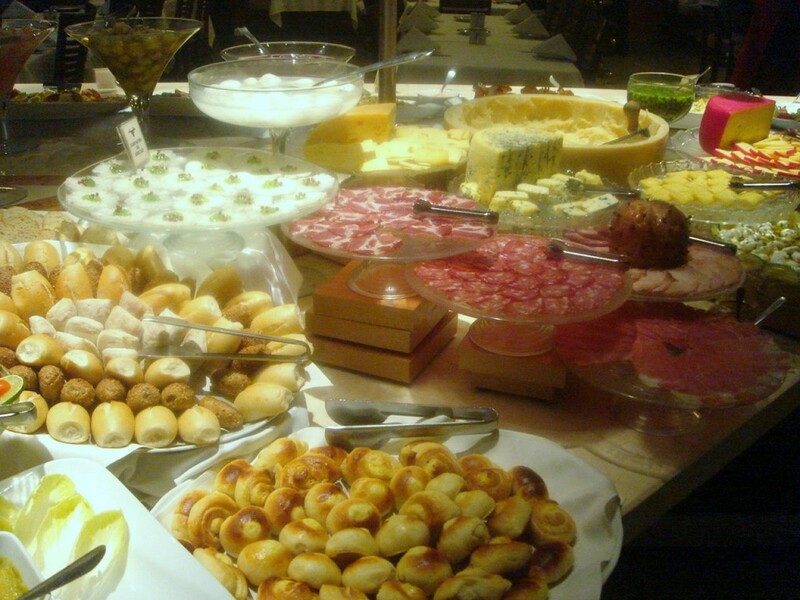 And with 70-80 buffet choices plus the different meats, there really is something for everyone at Boi Preto. And did I mention the sides? We were also given rice to accompany the meat, and there was also an endless stream of waiters coming around to our table to offer us other accompaniments such as banana fritters, chips or different types of risotto. For the quantity of food that there is, and the quality relative to the price that you pay, Boi Preto provides an excellent meal. It was also very good value by European standards. 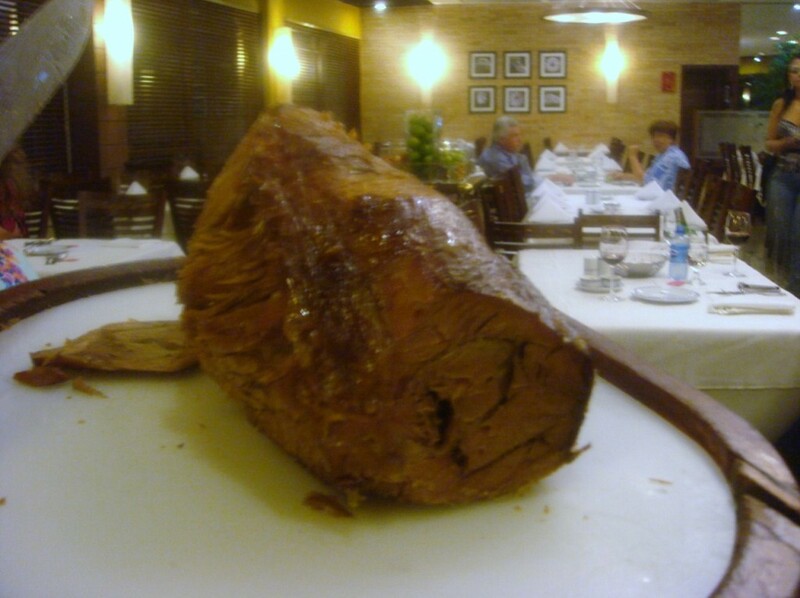 Like I said, churrascaria dining in Brazil is a true experience. Just be prepared to roll out of the restaurant afterwards. Price: R$72 (about £27). Excludes drinks, dessert and service. Oh my – definitely a place for elastic waist bands! I totally agree! I never need a reason to overindulge. 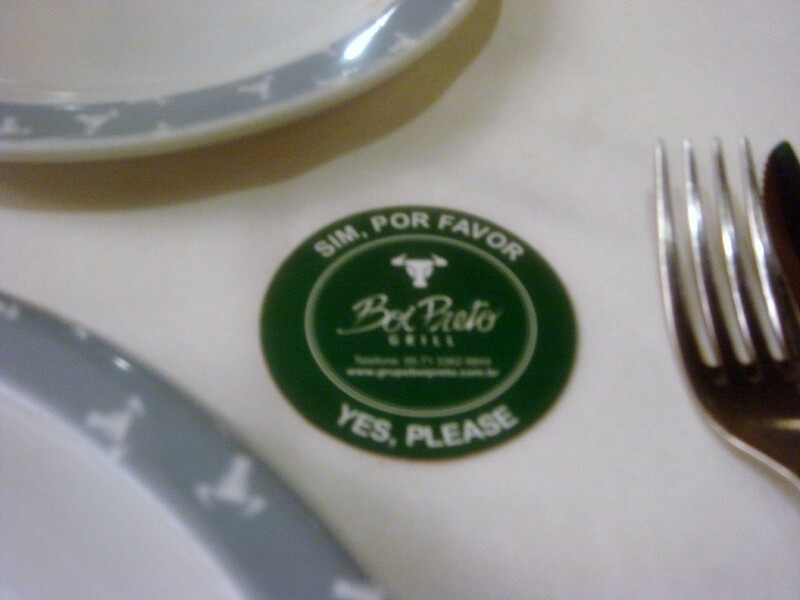 I love the idea of the little card – I want one permanently – yes more meat please! it was interesting to read your comment re rice in sushi and sashimi – but you were generally impressed with the Japanese food in Brazil? I remember being stunned on discovering all the Japanese food in Brazil, of course not realising the previous links..
also, what IS the reason why Brazilian (and Argentinian) meat is so famous? after all, there’s lots of talk on how the whole of Brazilian meat meat is working for (cheap, industrial) export market? Brazil has the largest population of Japanese outside of Japan, so it’s unsurprising that the Japanese food there is very good. I had some excellent Japanese food in Rio. However, most of the Japanese population is concentrated in the south of Brazil I think, and you don’t see many Japanese people in Salvador. Therefore I am more dubious about the authenticity of the Japanese food that you get here in Salvador. My understanding of what makes Argentinian beef so good is that Argentinian cows are fed on grass, typically in the humid Pampas region, rather than grains. As for Brazilian beef working for cheap exports, that could be true. But at the top end churrascarias, I think the probably source quality beef so this is probably not an issue. brazilian cows are also fed on grass and very similar to argentians (but u can also find cheap stuff in both countries to locals and export). in a churrascaria they will offer you picanha , filet mignon etc well done , medium rare , rare ….u have to accept according to your taste.